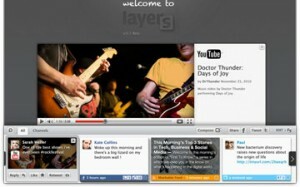 Layers is a social aggregator that provides a free application for the browser Chrome. This application allows you to see the new additions to your friends on Facebook and Twitter, something that many do, but the display is different, much nicer and also has added value because it allows us to include RSS news feeds from various sites. Thus, in addition to seeing what our friends post on these two social networks, we can also take the feeds of the sites we see every day, all in one place. The user interface displays a bar at the bottom of the screen that has all subscriptions. These subscriptions can be viewed directly from the Channels tab. When you click on a subscription, either Twitter, Facebook or RRS feed, shows all the associated content and if you click on a story that interests us, it is shown in the main panel. If we want to share a story we can do with an email or directly by sending a tweet or updating our status on Facebook. Undoubtedly Layers offers something different and useful.